Everything about A Little Something Different will catch anyone's eye. From the cute romantic cover to the fact that it was told in 14(!) viewpoints. Who wouldn't want to read that? It looks like it's as sweet as cotton candy and I don't know why, but whenever I see or think about this book, I remember the Disney movie Enchanted. This book is about a girl and a boy who met, liked each other...but too shy and afraid to talk to one another. As their attraction grew, people around them noticed the chemistry and their cuteness and these people (and other things)--from friends of both sides, match-making creative writing teacher, a barista, a waitress, a bench, a squirrel, and others--basically told their story. My unforgettable narrator was Victor, a creative writing classmate, who doesn't seem like fond of the two. He hated them and even call Gabe Big Foot and Lea Giraffe. I swear, everything about him is annoying but I also can't hide the fact that he was the narrator I kept laughing with. The way he is bothered with Gabe and Lea was so funny. I can also relate when he rolls his eyes when the two are being "annoyingly cute" and why they don't just "get on with it". Like you wouldn't know if he's bitter, just annoyed or what. I couldn't also forget the bench, for its love with butts (particularly Gabe's) and the squirrel and his missing acorns. Such cute little thing! I also adore their creative writing teacher, Inga, for being an enthusiastic match-maker. There was this assignment given by Inga--a one-hundred word description of someone without using any adjectives. For example (as given by Inga in the book), "My mom has a chair in her living room and when she sits in that chair the way she holds herself is relaxed. When she reads a book in the chair, it's like her habitat. When she settles down for an evening in that chair is all right in her world." Yet the listener is still able to picture that person. That's how this book looked like to me. It wasn't told in any of the main characters' perspective but it managed to describe them and live with them without leaving anything alone. It also gave me an opportunity to witness this couple and have my own share of thoughts and opinions. And for the most part, I wanted to cuff them both and leave them alone so they can finally talk. A Little Something Different is indeed like a cotton candy. It relaxes the readers and would make them think again of fairytales and happy endings. Original, fun and entertaining, a sigh-worthy book. 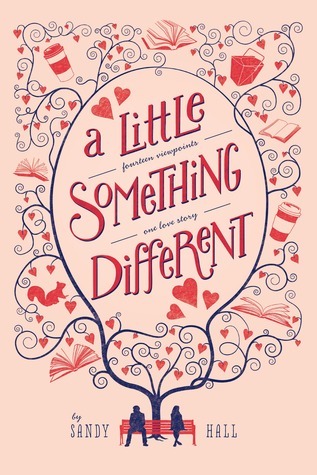 I recommend this to romance readers in any age and to anyone who want to get cozy in the midst of their stressful days. *Thank you so much Ruth and Macmillan International for the review copy in exchange of an honest review! THIS Book is an absolute must have for me. Good thing that I have it. Now, I just have to make the time to read it. And fast!